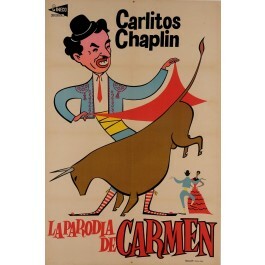 Comic version of "Carmen", Bizet's opera. Chaplin played Darn Hosiery, chief of the guard, which leaves everything to Carmen the gypsy. The film has two versions: one in 1915 (37 minutes) and this one from 1916. The movie was released once again 35 years after it's original released and the poster offered here is from that time.